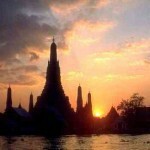 5* EVA Air non-stop flights London - Bangkok for £367 (€431)! Emirates return flights from Germany to Bangkok €422! I don´t think we have ever spotted any budget deal on Taiwan based carrier EVA Air as the flights are usually very expensive compared to their competitors. If you want to enjoy top service on-board of one of few 5-star carriers for affordable price you can now consider to book very cheap non-stop flights from London to Bangkok already for £367 (€431)! This is includeing all charges and 30kg bag. This interesting solution is also available for flexible travellers looking for direct solution from the UK to Thailand still this winter season.. If interested in this EVA Air promotion from the UK to Thailand you will find the cheapest flights between March and June 2017. Most of the cheapest flights are available in Q2 however you will find also find limited options in March. That means you can visit Thailand at the end of main tourist season for suc ha great price. (Also refer to our booking sample). Promo sale is running till 22nd of February or until sold out..Max stay 3 months. Travel dates – you can easily compare here at website of the carrier. Booking is also possible directly with EVA Air already for £383. Booking sample of this promotional offer based on 5* EVA Air non-stop flights London – Bangkok for £367 (€431)! In this case you would depart from the United Kingdom to Thailand on 5th of March. Your return flight from this classic destination in South East Asia to Europe would be then on 24th of March 2017.